Brisk Walking Delays Knee Replacement and Why Does Knee Pain Increase at Night? Study listed on Medscape finds “Brisk walking delays knee replacement” which is good news to those who want to put off a knee replacement! Why does my knee pain increase at night? 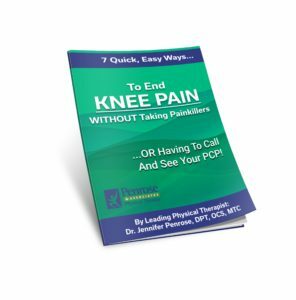 This question was sent to me yesterday by a reader suffering with knee pain at night: “Jennifer, I’ve suffered with on-off type knee pain now for more than a year. What I can’t put my finger on is when it started or why, and more confusing is that my pain gets worse as the day goes on. But whenever I wake up the pain is gone – or is considerably less. Yet, by the end of another day, my knee aches, sometimes feels hot and swollen and I’m often in considerable pain – especially if I’ve been out for a long walk with the dog. Any ideas?” – Beverly, 57, Lacey. What’s happening here is likely to be a simple case of the muscles around Beverly’s knee joint being “weak”. As in, the muscles just aren’t strong enough to last through the day or cope with what she wants her body to do and where she wants to go. Think of it like this: When you go to bed at night and are ready to sleep – your body is obviously tired from all of the energy you’ve used through the day. And your muscles, well, they’ve been working too. So what happens is that they get a rest when you sleep, you wake up and they ache less because they’re less tired and feel “energized” and ready for a new day. But if a muscle, any muscle, is weak or damaged in some way, it’s not going to be able to support you through the long day ahead. And so somewhere around dinner time, after a lot of “being on your feet”, muscles will “pack up”. And when they do this, joints, such as your knees, are left to fight their own battles! And that’s not good. Particularly if you’re aged 45+… as that’s the period where cartilage damage really beings (arthritis) and surfaces of your knee start to rub together. Hopefully that explains why knee pain gets worse at night! And without muscles to support these knee joints, (or just really tired and weak ones), you’re much more likely to suffer pain or aches. The same thing often happens with neck and shoulder muscles at night too – and it’s the reason why when you have the “flu” or a common cold, you always feel worse at night. Ever noticed your child get more “ratty” as the night draws in if he or she has a virus? Same thing going on: body puts up a better fight after a good nights sleep, as it begins to get tired again through the day, the virus or bacteria wins the fight! Knee pain at night works the same way! So the answer to Beverly’s knee pain at night problem? Well, it’s likely to be a simple case of strengthening knee muscles (and hip and lower back ones too) to make them stronger. But here’s something people often get wrong: walking a dog everyday will do very little to strengthen muscles- if anything, it’ll make weak muscles worse and mean you’re more likely to suffer more pain, not less. No, the answer is not found in more exercising, it’s in doing the right exercises to strengthen the right muscles which means your knee will be strong enough to walk, meaning you can keep your heart and lungs healthy, and do it with less knee pain at the end of a day or knee pain at night. So there you have it, why knee pain gets worse at night and the simple thing you can do to help ease it. And if you want free tips on knee pain go here to get your free report here.